The Hadza are one of few hunter-gatherer groups in Africa. Scientists hope they will give clues about why humans share. The man is from a society called the Hadza, one of the last remaining hunter-gatherer populations in Africa and one of the closest remaining approximations to how the earliest humans lived. This community in Tanzania is so cut off from modernity that news of bin Laden’s existence hadn’t reached this man until five years after 9/11. People in Hadzaland may not use Facebook or drive cars, but they have something fundamental that's in common with the Western world: Their networks of social ties look a lot like ours, according to a new study led by Apicella. Most interestingly, researchers report in Nature, the Hadza tend to be friends with people who are similar to them in the behavioral traits of cooperation and egotism. That’s a striking result if the Hadza are truly a window into the earliest human societies. Cooperative behavior - acting in a way that personally costs the individual but benefits others in the group - has always befuddled evolutionary scientists. Established ideas about natural selection suggest that only organisms with the “fittest” genes survive and reproduce; altruism isn’t part of that picture. But Apicella’s study offers an explanation. “If we live in these networks where we tend to interact with people who are like us - cooperators tend to interact with other cooperators - altruists could help each to other to survive, and that’s how altruism as a trait survived in humans,” said James Fowler, professor of political science and medical genetics at the University of California, San Diego, and co-author of the study. Scientific studies have found that people who resemble one another physically, and even genetically, tend to form social ties. There’s a genetic basis for networks, too. Identical twins tend to structure their networks the same as each other, and more similarly than fraternal twins do, Fowler said. That got the researchers interested in how far back in human history modern social network structures have existed. "One of the reasons why I think Facebook is such a phenomenon: It’s because it's tapping into something that’s part of our identity as humans," Fowler said. Apicella has been visiting the Hadza since 2004, and all of her trips put together total over one year with them. She communicates with them in Swahili, although they primarily speak a click-based language they call Hadzane. Their society has a sexual division of labor, Apicella said. Men hunt everything from rats to zebras, while women gather berries. When the weather is dry, the Hadza will sleep outside. During the rainy season, women build grass huts with tree branches and dry grass. Hadza individuals are not tied down to any particular camp, and the camps themselves shift location every four to six weeks as resources in the area get used up. People tend to stay with their immediate kin and children. But the Hadza aren’t completely isolated; they're having increasing contact with modern society. Anthropologists such as Apicella and her adviser Frank Marlowe have visited them. The Hadza also have contact with pastoralists who keep sheep and goats, and tourists have also discovered at least one part of Hadzaland. There are about 1,200 members of Hadza society known, Fowler said. “The Hadza are remarkable, in that what we have essentially is a population that have retained hunter-gatherer lifestyle, and are living in an environment in East Africa, an environment in which human evolution occurred,” Apicella said. In the new Nature study, the researchers did a few experiments to test the structure of Hadza social networks. They asked Hadza from 17 different bands whom they would prefer in their next band. 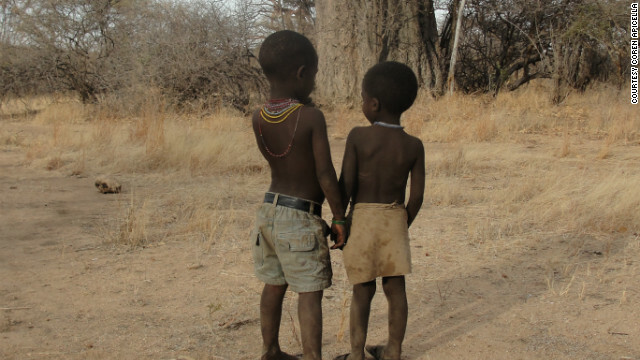 Researchers also gave Hadza individuals three honey sticks and asked them to secretly name a recipient for each stick. Honey is beloved by the Hadza. To differentiate cooperative people from the rest, researchers gave the Hadza participants four honey sticks that they could anonymously contribute to a communal pool if they wanted. They were told that contributing a stick to the pool would lead to that stick being tripled, and given out to band members equally. Each person could choose to keep all, some or none of the sticks. Those who gave sticks away were considered to be more “cooperative” because they would be personally worse off but made the group better off. “The social network is just as important as genes and the physical environment in explaining these clusters of cooperation that we find,” Fowler said. As with social networks in Western cultures, popular people among the Hadza are friends with other popular people, according to the study. A person’s friends tend to be friends with one another. And similar people are friends with other similar people - in fact, you are more likely to be cooperative if your friend’s friend is cooperative. And like us, a person who names another as a friend is likely to have the friend name the first person as a friend, too. And they tend to befriend people similar to them in height, weight and age. Most friendships are with people who are geographically close, which makes sense since it’s costly to walk long distances to visit others. Apicella hopes to return to the Hadza for further research. Social networks are not only a developed world phenomenon. If there are only 1200 Hadze remaining this may be a short career for Dr Apicella. During the Rwandan Genocide, I think the liquidation rate of human life was about 100 lives per hour. Dr Apicella, maybe you could direct your intellectual energies to preventing something similar (whether deliberate and quick or haphazard and slow but equally intentional) happening to the Hadze rather than amusing your curiousity, getting grants, or satisfying your apparent need for media attention (Yes, I viewed your web site). http://www.bizzidate the new generation of sharing Platform. You can share all contents (friends, events, videos, photos, music). I'm not an anthropologist, but back in the seventies I was involved with government (Tanzania Govt) on trying to help these people by trying to put their children in schools, and also change the tribe's migratory behavior. The government wanted to establish some social services for them and rescue the tribes diminishing numbers The government was bombarded with a lot of criticism from anthropologist mainly from outside. Their argument was that these people were to be left as they were. No change was to be enforced on them etc for those changes we were trying to put in to their tribe ,were violations of their basic rights. But while the Hadze were clinging to their traditional way of life, should not t other ethnic groups neighboring them were changing. The Barbeig for example were encroaching into their land and as such, the Hadze were being pushed into smaller unsustainable areas for their tribes' survival.The Hadze are going into extinction The tribe now numbers in less than a thousand. So if they don't change now, 50 years from now they will be history. Wonderful Article Elizabeth! It leads to another conversation that goes beyond your October 24, 2009 article and deeper than any “me to” anomaly that increase the occurrence of STD’s and Obesity. Your article: Remote Tribe Has Social Networks Like Ours prods one to think they did as we are doing it again through our digitally mediated social networks, namely, we are looking out for one another. This has become a subject discussed by sociologists, anthropologists, even social-economist Jeremy Rifkin now in two of his recent books. What is deeper is the impact human social networks have on the way we think and what we choose to believe. This issue is a scary one, it is the phantom that intrudes on too much of our lives with its presence never seen or recognized if we let it. Said simply: The deeper issue is the extent “Hive Thought” replaces “Individual Thought” in our day to day affairs. We are all victims of the influence of our peers that more than not we become victims of the dictates of our peers. There are no rules of how this comes to be or what person becomes leader or persons become committee to make the determination of “What we think about it” or “How we act on it.” It just happens. Determinations are made and enforcement applied silently and without notice. Nonetheless the persons adhering to a social network that becomes a hive think like the hive and not for themselves. The sorry thing of our culture is that too many are of the hive, too few are independent thinkers. Evolutionary science has ruled our culture mediated through the vehicle of Capitalism since the Enlightenment has produced social, technological and academic advancement beyond imagination. It has brought us to believe progress will only occur if we compete with each other to gain the most out of anything we undertake. Doing this we garner the most out of each undertaking but are kept in check by those competing with us. In this way being selfishness produces unselfish result. They call it equitable balance. This was good thinking from the time of the enlightenment to the 20th and 21st centuries. Now in the 21st it is out of kilter. The “Haves” are having more and the “Have Nots” are growing exponentially. Media, Global Corporations, Banks, Stock Markets and any number of other influences have broken the engine that made things equal and has produced one small bunch (1%) in the U.S. exploiting all of the rest (99%) remaining exhausting the infrastructure to boot. The Hive has directed us as a culture to support Capitalism over all other systems. In spite of that admonition we have seen what it did in the Depression. We have seen how it took a World War to replenish out culture’s coffers. For a period of 30 years it gave us a period of security and prosperity. Then in the ‘80’s unbridled capitalism turned into economic despotism where we are now and not being too successful digging our way out. It is in this I see value in “Cooperative Behavior;” value in asking your neighbor “What can I do to help?” At this time our neighbor is the object we are meant to overcome. How different to give that person help. It is hive thinking that has canonized capitalism for the past 500 years. It is time for our society to hone some less absolutistic rules where we can start doing for one another. It is independent thinkers who must convince the hives of this. Cooperation is natural, basic and more adaptable by the hive, so long as it is evident in its influence. Humans are a pack animal like bees, chimps, and wolves. We need the support of the group for the survival of the individual. The social network(facebook) connection is a stretch. Facebook is about ego, and creating an image for approval from others. Connecting with people too, but the focus is sharing the "right" pictures and jokes not to mention collecting hundreds of so called "friends" who have nothing to do with your day to day life. Those relationships are usually more superficial .Now people sharing honey for the greater good of the group, with people they have a close relationship with and rely on to survive, that is a completely different. That level of hands on cooperation is not required from the online relationships. I'm a hunter-gatherer. I pick through bags of hand-me-downs just like those people do. I doubt they are as primitive as we are meant to think. yes they are primitive. they are going into extinction They are refusing change, thats why they are disappearing.Something has to be done on the study of their language and their herbal medicine! One of the "last remaining hunter-gatherer populations in Africa"? Seriously? You are misinformed. I can think of 3 East african tribes from my own experience who are still "hunter-gatherer populations." We still have some of the Iraqis and the Sandawi adjacent to the great plains of Serengeti and Lake Manyara! Why is this new? because is in Africa? what about the Indians in American? This sect you Talk about in Africa are obviously more in touch with happens that those Americas (Indians) in the Amazon forest, why not study them for your findings? Happenings should have enlightened this kind of thinking, our civilization has brought us nothing but death and destruction. Distrust and mistrust characterized our so call civilized world and we look to treating a pure human society with worth for life and dignity for human being as object of mere study instead of learning from them on how we return our society to love and dignity to human life? I can't for the life of me figure out what difference it makes WHAT tribe gets studied. Do you just go around looking for things to argue about? Agreed, why do you care who was studied? Having things in common helps build Friendships than not having anything in common at all, its common sense... Duh.. I do think this is worth some study, if only to affirm that altruism is a truly marvelous evolutionary trait that will benefit us in the end. But you don't have to intrude on these people to do it. Anyone who has experienced it knows it is a good thing. Friendship, cooperation and empathy induce its own rewards. Aware people already know that! Good folks who are still attached to religious practices consider it grace. Atheists understand this as a wonderful thing we all need to find in ourselves. Our consciousness appears to give us the potential for this beneficial feeling. It appears to be an emerging instinct of our morality. Hence, some claim it to be the specific property of their religion. Atheists know it is in all of us. i am sorry but this concept of altruism and cooperation died when "civilization" was created. to have a civilization you need a hierarchy, and when you have a hierarchy is when the ego steps in. in their society it is more beneficial for the entire group to work together, sounds like socialism. now try to get that idea to work in most "civilized" societies. we can't. even get a national health plan in the states. Science meet ignorance. Evolutionary traits don't disappear just because environment changes over a few millennia. If humans weren't still largely altruistic, civilization would collapse. Altruism is probably even more necessary in civilization than in small tribes for cooperation has to happen on an even larger scale. As an anthropologist working at a university in the US, I found all of the comments extremely interesting. Like many of you, I found this article annoying and overly simplistic. That last sentence of the article really strikes a tone of utter disregard for human dignity and respect. There are a number of us in the anthropological community who find this kind of research deplorable. The Hadza are not a window into anyone's past. They do not hold any clues as to the evolution of cooperation in humanity. They are completely connected to the outside world through trade networks with other groups, other anthropologists (not mentioned in the article), missionaries, government officials, etc. Just because someone asks about Bin Laden in 2006, doesn't necessarily mean that it took the information that long to get there. You cannot run experiments on contemporary cultures and use those finding to argue about a past way of life. If you go study cooperation among a group of pigeons in downtown NYC does this mean you have insight into the cooperative behavior of the ancestor of all bird species? Finally, did the researcher let the people keep the honey sticks!!!??? Thank you! Save me some time from writing pretty much the same thing. At least I can use this rather stupid article in my intro to cultural anthropology class to explain the problems with the comparative method. Really! Leave these people be. Wouldn't an enlightened anthropologist have more sense than that? Thank you! I found Dr Apicella and her colleagues' work annoying and simplistic. Anyone else remember Fabian's Time and the Other? My dear, did she not have take the graduate seminar on anthropology and representation or did Harvard not offer it? Didn't Drs. James Clifford and George Marcus once work in that department? Evolutionary biology can be interesting but this one example is really dicey research at best. Thanks for the conversation folks! It's not possible to observe...experiment on...indigenous peoples without corrupting them. This guy's selfish quest for knowledge will result in the downfall of the Hadza. I wonder if, at the end of his "lifelong pursuit", if he'll express regret for having indulged his curiosity at their expense? Or whether he'll simply shrug and say, "the pursuit paid the bills for 40 years and I never had to work for any one employer"
It's not a guy, it's a woman. Maybe you could actually read the article. most def not a he. have you seen her? "Cooperative behavior – acting in a way that personally costs the individual but benefits others in the group – has always befuddled evolutionary scientists. Established ideas about natural selection suggest that only organisms with the “fittest” genes survive and reproduce; altruism isn’t part of that picture. But Apicella’s study offers an explanation." Untrue. Read Dawkins' 'The Selfish Gene.' Published in 1976. Altruism at the individual level arising as a result of selfishness at the genetic level is one of the main focuses of the book. Not only is altruism "part of that picture," it is a necessary part of the picture. If you are writing an article that even touches on natural selection and evolution, please take the time to understand it yourself first. Thank you for pointing out the obvious. Apparently the sociologist in the story doesn't do interdisciplinary studies. The altruistic gene helps copies of itself survive, albeit in other organisms. It's still purely selfish on a genetic level. Anyone who read this article needs to get a copy of The Selfish Gene to get the real picture. CNN, like most other popular internet article providers only introduce topics. If they did otherwise, they would be catering to a different market (much smaller one). I agree with you though that there is a glaring omission about the results of the honey sticks; but it is probably because the results are either not simple to interpret or not exactly crowd-pleasing. Humans “give” for the sake of getting back something in return much more than we are aware of or are willing to admit. The greedy white man wanted the natural resources like gold, diamonds, rhinos, elephants,etc etc. The colonialists then taught these people their ways of life so now, they took go plundering the rest of the fauna and valuable blood diamonds. Facebook is a huge step backwards. Protect these people! leave them alone, please – did they seek YOU out??????????? Altruism (although not well understood) has been accepted as part of the neuroeconomic make-up of human beings for at least 100 years. It is not the rarest of traits in a species either. As long as we've known about worker bees we've accepted altruistic behavior as macro-darwinistic.
. . . . . and after the "study", then what? What bush did those shorts grow on? just let them be? that's more demeaning then anything the scientists said or did. real consistent philosophy, condemn the scientist for being demeaning then you say let them be like they are innocent, stupid children that need to be protected because they can't take care of themselves, u also are an idiot. "As long as we have them, I think they are worthy of study." ??????????????????????????????????????????????? And what the heck does this statement mean????????????????? She probably means that as they have more contact with those outside their group, their social structure and way of living will change and they won't be purely hunter gatherers. Exactly. "Who care about the people themselves. They are just great sience objects." It means they are at the anthropologist's disposal. I do not agree with the demeaning tone of the article. This what Brazilian government will not allow you do to the people of the amazon forest. These are humans and the fact remains that their dignity should be respected rather than be written about like some species from the prehistoric era. I do hope you can also learn decency, honesty and faithfulness from them. When anthropologists talk about human development they mean "be like me". I see no reason to believe that those societies are anything like early humans. The assumption that their societies stayed frozen in time is not justified. It is something you would expect to be said a century ago and not today. You are more likely looking at two different ways soceities developed. What an odd view of the world you have musomesa. "When anthropologists talk about human development they mean "be like me"." Utter nonsense, you have no evidence to support this ridiculous statement. "The assumption that their societies stayed frozen in time is not justified." Again, nonsense. These people literally live in the stone age. While the vast majority of societies on this planet have evolved and progressed, these people have not for whatever reason. That is certainly worth study. Primitive tribes should not be exploited, however there's nothing admirable about being stuck in the stone age. Life was very hard and short for humans back then. There was much suffering and early death from medical conditions that are easily treatable now. You leave me speechless, you live up to your own name. So the news is that they are like us? What region or district in Tanzania are they found and if they speak swahili that indicates they are intergrated in the Tanzanian society. We 'Inupiat' ('Eskimos' to the Western Society, et.al.) have similar customs and traditions of 'accepting foreigners' AND the 'technology' that they bring "into the Country" (to borrow a phrase from author Jon McPhee) – EVEN though we CONTINUE to maintain and practice our Age-Old "Customary and Traditional Seasonal Hunting and Gathering of "Neggepaq" – Annually-Renewed Natural Resources Indigenous to Our Customary and Traditional 'Country' "- termed 'Subsistence' by the dominant the Western Society. 3.) We hunt with Western Society technology – rifles with Scopes, shotguns, binoculars, etc. 6.) Live in Western-style Houses – for the Same Reasons. Sir, I like your comment- story. you are 100% right. I spent 13 years in Afrika. One african told me that before the white men occupied our continent all Africans were happy people. Why did you not leave us alone? I felt ashamed. While African societies and cultures have surely been messed up colonial powers, I just want to put out there that I know an elderly dark-skinned South African man who genuinely insists that the country was better off under apartheid. I'm not saying I agree with him (hell, what do I know...), I'm just saying these little vignettes don't make for the best arguments. Why is this posted under the "US" headline? are they keeping them that way so they can study them? that would be wrong. Yes, bring them civilization. That worked out real well for North American Indians.